The first Aggie football game against the South Carolina Gamecocks was this past Thursday, and we couldn’t have been any more pumped! 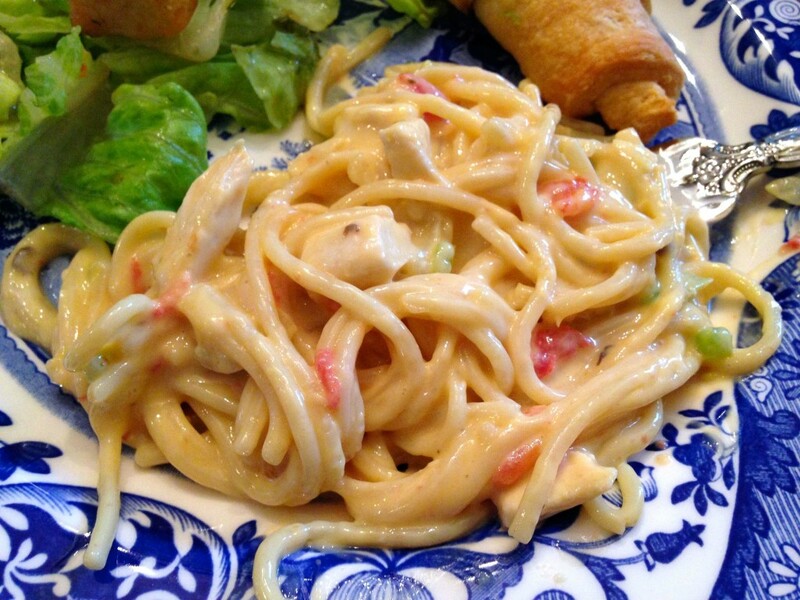 Chicken spaghetti is one of those comfort foods that is a crowd pleaser. 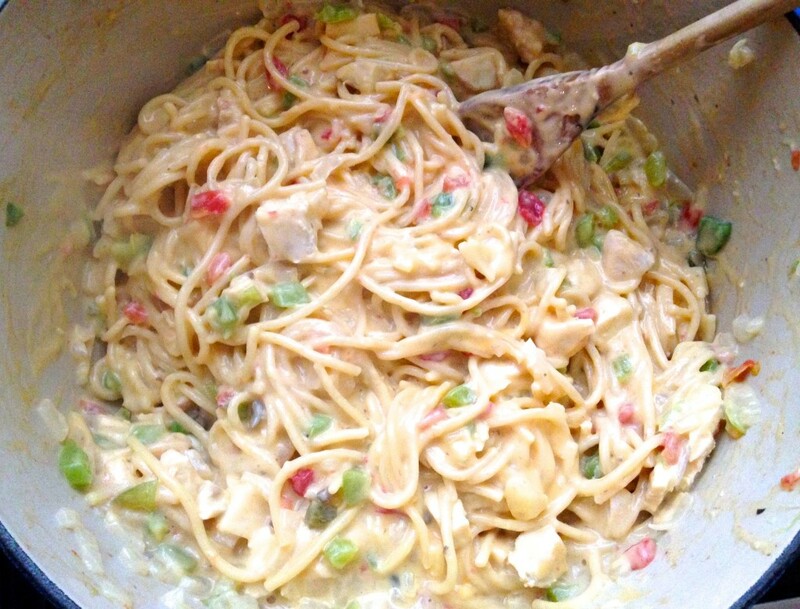 I’ve made the Pioneer Woman’s chicken spaghetti before, but wanted something a little different this time. I found this recipe on Pinterest, and liked how only one pot was needed to make this meal, and it didn’t involve the oven. 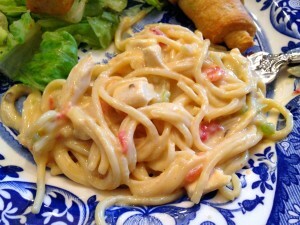 It was absolutely delicious and made a ton! Matt, his dad Tony, and his uncle Rusty filled their plates completely with the chicken spaghetti, and even after going back for seconds, we STILL had tons of leftovers. I put one small dish of leftovers in the fridge to eat for the rest of this week, and a larger dish in the freezer for a meal to have later on. 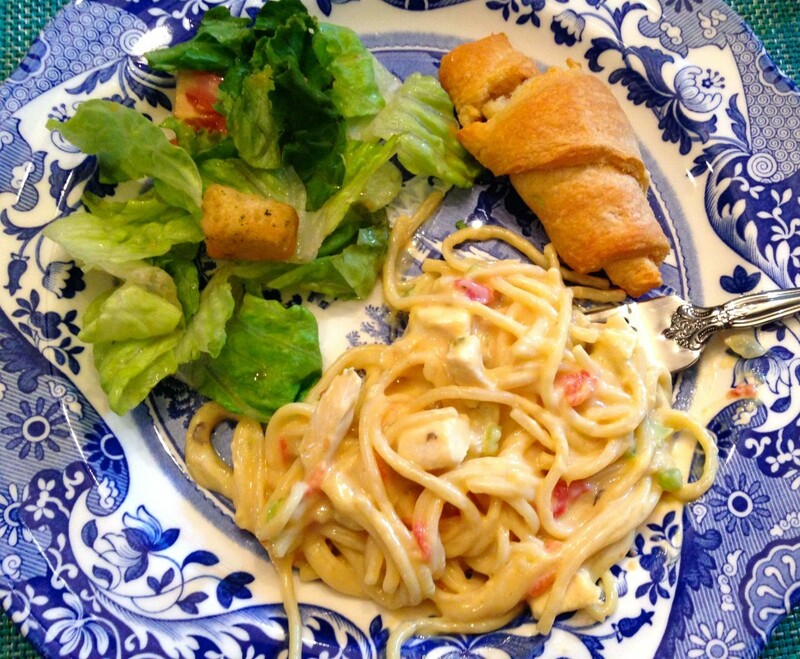 Serve the chicken spaghetti with crusty bread and a salad, and you’ve got yourself a meal! Plus, how could you forget dessert? I made Matt’s all-time favorite 4-Layer Pudding Dessert. Yum!! Can’t wait for more football and good food to come this fall season! Saute onion, bell pepper and butter in a large pan. Add Rotel, chicken, and soups and mix thoroughly. Add cooked spaghetti and velveeta cheese. Cook until cheese is melted. Serve immediately with a side salad and crusty bread. Boil spaghetti pasta in water according to package directions. Drain pasta after done and discard water. Set aside the pasta. Do not rinse. 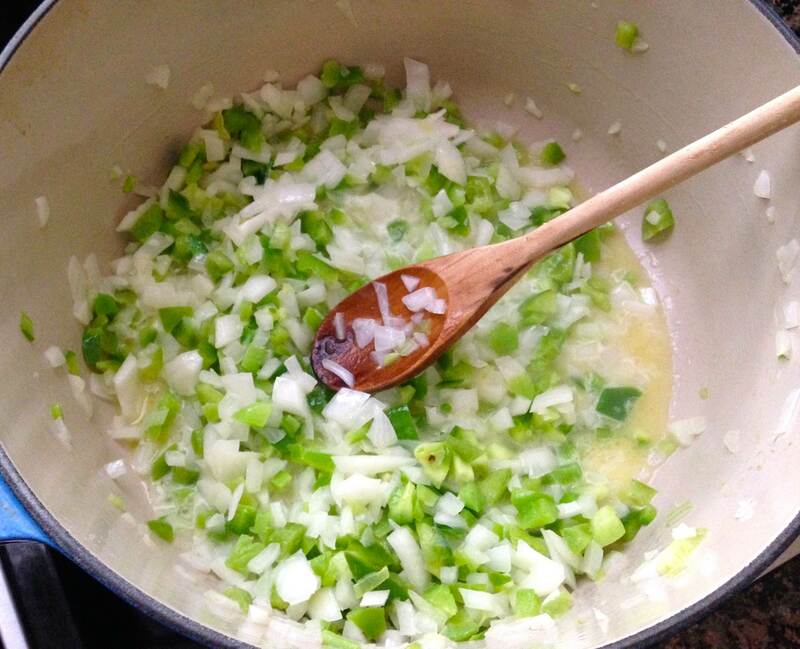 Melt the butter in the same (empty) pot and sauté the onion and bell pepper. 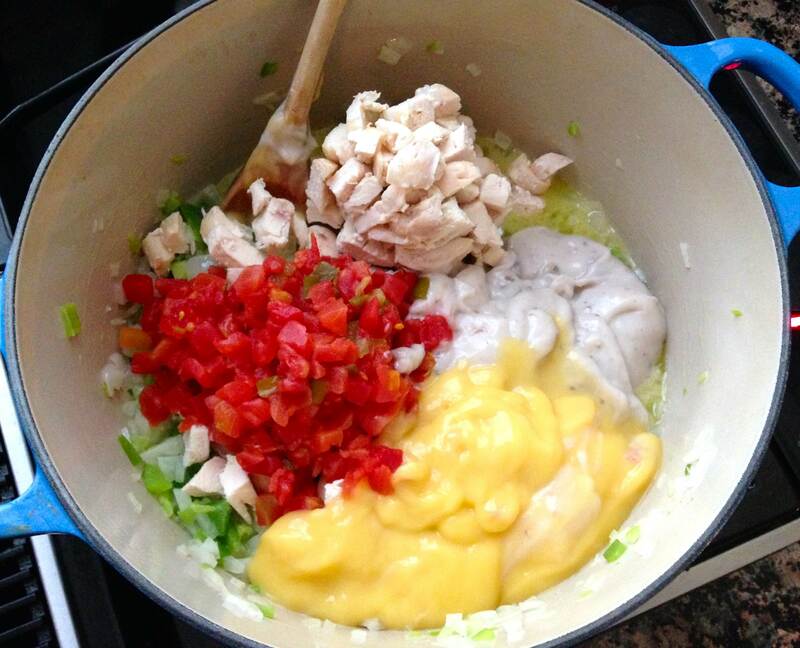 Add Rotel, soups, cooked chicken, and spaghetti to the sautéed onion mixture, one at at time, and gently mix together. Add velveeta and stir together, mixing well. Add salt and pepper to taste. Heat until cheese in melted thoroughly, stirring occasionally to keep from scorching. Happy Easter...Time for Carrot Cake! 2 Responses to "Stovetop Chicken Spaghetti"
Friends made this for.us right after I had my third baby, a month ago. We liked it so much (including my mostly vegetarian husband) that I’m making it again tonight. Putting in marginally less (10 oz) or velveeta to make it marginally less caloric. I’m eating it out of the pot waiting for said husband. Yum. Even my somewhat picky 2 and 3 year olds are loving it!! Have you ever tried to freeze it? I’m wondering if I could freeze the leftovers. Or make extra for another meal. Velveeta says not to freeze it on the box….so I wonder if you have any experience either way.